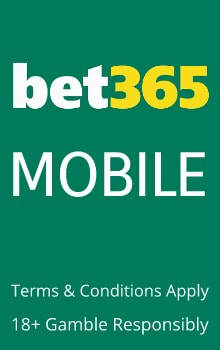 Bet365 is our favourite sportsbook for mobile sports betting. We love live streaming every horse race in the U.K and Ireland from our iOS or Android. You can setup alerts so you never miss another horse race or game again. Live visualizations allow you to follow a variety of sports and racing on your phone. Download the app from the app store or use instantly from your phones browser. Right off the bat, we are impressed with Bet365’s mobile application. Much like Bet365.com, their mobile application is full of options and customizations, along with a large list of betting markets. One of the best features of the app is the ability to customize it to player’s betting preferences. We could choose their odds type and language, along with other customizations. Everything is available for players in just a few clicks. They can place wagers, view their current open bets and view their bet history. In-play wagering or live betting has recently been added to the repertoire of options for bettors. The in-play wagering on the mobile application works exactly like it does on the main site, which impressed us. It is seamless, quick and uncomplicated to use. Looking at live betting markets and finding the right bet could not be any easier. Bet365’s mobile application is fundamentally a watered down version of their main betting site – which is a good thing. Using the same color scheme and a similar betting interface, the app is smooth and polished. From our use, it appears to be error free and quite stable. One complaint bettors may have had is that it is not as innovative and graphically impressive as other betting applications. Personally, we like this about Bet365. The lack of large graphics and long loading times are good things. We want a betting application that lets us use all the offering of a large sportsbook on the go and Bet365’s app does just that. Bet365 is known for their extensive betting menu, and large number of markets offered, and the mobile app is no exception. If there is a sport being played and people are betting on it, Bet365 has wagering odds available – it’s that simple. There are few complaints – if any – regarding Bet365’s product. Bettors can now take the excellence of Bet365 and their insane amount of betting markets on the go and bet from anywhere across the globe. The app itself is a testament to the incredible work Bet365 has done with their betting interface. The mobile platform is simply a scaled down version, and it works flawlessly. For serious mobile bettors, there are few options better than Bet365.